Having determined that the lower levels of Airway Q41 were underutilised, FASVIG consulted twice on proposals to make Airway Q41 accessible to VFR aircraft and aircraft which are unable to fly IFR in Class A airspace. There was widespread support for the proposals but technical difficulties were identified. The first consultation proposed reclassification to Class D to enable airspace sharing by all airspace users but objections from NATS made that untenable. The second consultation proposed to change Airway to Class G below FL75 but in addition to further objections from NATS there were specific climb and descent issues for Aurigny aircraft using Alderney. 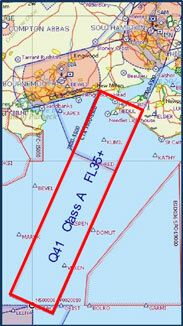 It was decided to split off a proposal using the Release of Controlled and Segregated Airspace (RCSA) procedure to change Q41 to Class G below FL55 as that is commonly agreed. That would achieve part of the safety improvement envisaged by doubling the time available to single engine aircraft following an engine failure; it would be proposed for implementation by March 2017. Policy changes to allow airspace sharing would be brought forward and potential options for higher levels would be developed in due course following the full CAP725 Airspace Change Procedure. The submission below was delivered to the CAA on 28th October 2016 in expectation of a quick decision to catch the AIRAC cycle which will lead to the change being on the next UK south ½ million chart in March 17.